You shall bind them as a sign upon your hand, and they shall be for a reminder between your eyes. You have a brain. It is in one world. Your heart is in another. And your hands often end up involved in something completely foreign to both of them. Three diverse machines. Tefillin are a pair of black leather boxes containing Hebrew parchment scrolls. A set includes two tefillin—one for the head and one for the arm. Each consists of three main components: the scrolls, the box and the strap. The scrolls are inserted into boxes made of leather that have been painted black. One box is strapped on your head, and the other onto your arm next to your heart. It’s done once a day—preferably during the morning prayers. If that is not practical, say at least the passage called the Shema (found below). It’s done by Jewish males, age 13 and up, every day except Shabbat and major Jewish holidays. You have two black leather boxes with straps in your tefillin bag. One is for the arm, the other for the head. Take out the arm one first—that’s the one that’s one smooth box, rather than four compartments. Remove the tefillin from the plastic case. 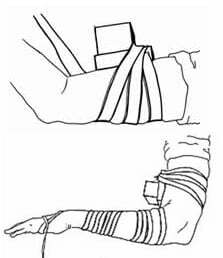 The arm-tefillin goes on the weaker arm: right-handed people do the left arm, lefties do the right arm. Roll up your sleeve so that the tefillin is in direct contact with your arm. Put your arm through the loop formed by the knotted strap. 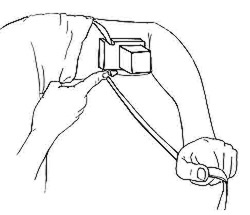 Place the black box up on your bicep, just below the halfway point between the shoulder and the elbow, right across from your heart (see illustration). Recite the blessing. If you can read and understand the original Hebrew, say it in Hebrew. Otherwise, you can say it in any language you understand. Baruch atah Ado-nai, Elo-heinu melech ha’olam, asher kideshanu b’mitzvotav, v’tzivanu l’haniach tefillin. Blessed are You, L‑rd our G‑d, King of the universe, who has sanctified us with His commandments, and commanded us to put on tefillin. Focus on what you’re doing. From the time you make the blessing until both tefillin are in place, do not talk. Don’t even wink. Just concentrate on hooking up your mind, heart and deeds, and binding them to G‑d. Tighten the strap around your arm, mindful that the knot stays in direct contact with the box. Continue to wrap: two more times over the strap-socket of the black box and around the biceps, then seven times around your arm and once around your palm. Leave the remainder of the strap loose. Next, get out the head-tefillin. Remove the tefillin from the plastic case. The box goes on your head, just above your forehead. Center it in the middle of your head directly above the point that’s right between your eyes. The daled-shaped knot should rest on the base of your skull. Now back to your hand. Wrap the remainder of the strap three times around your middle finger, like this: once around the base, then once just above the first joint, then one more time around the base. You’ve got some strap left over, so wrap it around your palm and tuck in the tail end. Be conscious that G‑d Himself commanded that tefillin contain four Biblical passages which mention His Unity and the Exodus from Egypt, in order that we remember the miracles and wonders He performed for us, demonstrating that He has power and dominion over all. Also note that He has enjoined us to place the tefillin on the arm adjacent to the heart, and on the head over the brain so that we submit our conscious soul (which is in the brain), as well as the desires and thoughts of our heart to Him. Thus tefillin serve as an inspiring springboard to serve G‑d in a state of inspiration and to study Torah, His wisdom. At very least, take a moment to remind yourself that tefillin is a mitzvah (commandment) of G‑d. Sh’ma Yis-ra-eil, A-do-nai E-lo-hei-nu, A-do-nai E-chad. Ba-ruch sheim k’vod mal-chu-to l’o-lam va-ed. V’a-hav-ta eit A-do-nai E-lo-he-cha b’chawl l’va-v’cha u-v’chawl naf-sh’cha, u-v’chawl m’o-de-cha. V’ha-yu ha-d’va-rim ha-ei-leh, a-sher a-no-chi m’tsa-v’cha ha-yom, al l’va-ve-cha. V’shi-nan-tam l’-va-ne-cha, v’di-bar-ta bam, b’shiv-t’cha b’vei-te-cha, uv-lech-t’cha va-de-rech, u-v’shawch-b’cha uv-ku-me-cha. Uk-shar-tam l’ot al ya-de-cha, v’ha-yu l’to-ta-fot bein ei-ne-cha. Uch-tav-tam al m’zu-zot bei-te-cha, u-vish-a-re-cha. Hear, O Israel, the L‑rd is our G‑d, the L‑rd is One. Blessed be the name of the glory of His kingdom forever and ever. You shall love the L‑rd your G‑d with all your heart, with all your soul and with all your might. These words which I command you today shall be on your heart. You shall teach them thoroughly to your children, and you shall speak of them when you sit in your house and when you walk on the road, when you lie down and when you rise up. You shall bind them as a sign upon your arm, and they shall be for a reminder between your eyes. You shall write them upon the doorposts of your house and upon your gates. 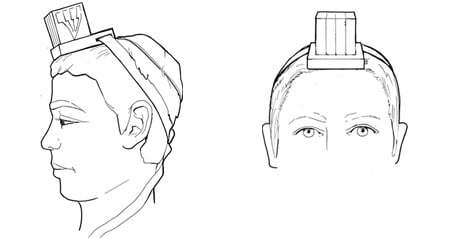 Tefillin instructive guide entitled: How to put on tefillin. (שבט 2019) Excellent! Among your best writings yet. You have inspired us, we who do put on Tefillin, we who don't or can't or any other category. The Right ties the Tefillin on the Left One may wonder why the tefillin are tied on the left; wouldn't it be more respectable to tie on the right? The answer may be that the right represents strength; it is already strong, so to say. The left represents weakness, and needs to be strengthened. Thus, with the right; we tie the tefillin on the left, to strengthen it and bring holiness. My Father's Tefillin One of my favorite memories is waking up and going to watch my Father of Blessed Memory, facing east and praying with his Tefillin and facing Jerusalem (I always knew which way was east from home). No luck with your son I am not a Rabbi but you know what: sometimes each person just turn to G-d and cleave to him for good, all in his own time and in G-d's time. Sometimes we are not ready spiritually even though the deepest corners of our soul desperately long for G-d's everlasting presence. However, it is good to encourage your son without making it seem like you're forcing him. It's all about pointing him towards the right direction while showing him that he has a choice. FYI A subject that you can wrap yourself into! Reminds me of teh story on the plane recently When a Jewish boy put on Tefillin on a plane in US recently [and it was soon after the story of a suspect terrorist who got onto a plane in another part of the world] they made an emergency landing. We wondered; 'don't they know what Tefillin is and they see a normal Jewish boy; how spooked can they be?!' But apparently they did not know. The mitzvah of wrapping Tefillin (and scrupulously saying Tehillim) have saved a lot of Jews from distress. Although it is great to perform a certain mitzvah, it is brings even more benefit and blessing if one does it because he wants to - instead of thinking of it as a chore. Great but, I wish the Shama was spoken instead of being sung...too cluttered, words run together. "The time to put them [Tefillin] in the morning is at the time when one can see his close friend from four cubits away and recognize him." There is a wide range of opinions precisely when this measurement occurs. Generally, it is accepted that it is light enough to see your friend and recognize him long before actual sunrise. For example, for me in California, earliest tefillin is at 5:48 AM, but sunrise is not until 6:34 AM. For exact times of when one may put on tefillin each day, you can check chabad.org. You just put in your zip code, and it will give you exact halachic times.